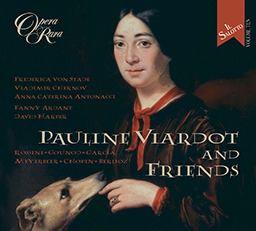 This is the fifth opera in the Essential Opera Rara series and, once again, a vivid impression of the work is captured on a single disc. Whereas Schiller’s tragedy and most operas on the story of Mary Queen of Scots concentrate on her condemnation, final confession and execution, the story of Mercadante’s opera deals with an earlier period of her life, when she was struggling to maintain her authority and independence from the overbearing and bullying ambitions of Scottish chieftains and nobles. One of the greatest difficulties that confronts anyone opening a score or libretto of Mercadante’s Maria Stuarda regina di Scozia is to identify just who all the characters are. Ultimately, though, does it matter? Quasi-historical figures and a plot in which the hero ultimately rescues the heroine from the villain’s clutches is simply a framework on which to hang this exhilarating music. It is clearly the music that matters and Mercadante, here in his early Rossinian manner and writing for the English prima donna, Elizabeth Ferron, pours out lashings of bel canto melody and bravura for our delight. At its Bologna performance in 1821, Maria Stuarda, in the words of a contemporary reviewer, ‘offers room for much praise’. We doubt that any of you would disagree! 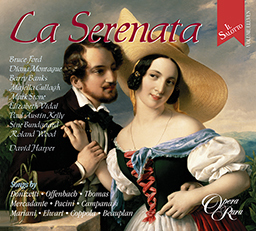 This is the fifth opera in the Essential Opera Rara series and, once again, a vivid impression of the work is captured on a single disc, accompanied by a complete libretto and article by the eminent 19th century musical scholar, Jeremy Commons. 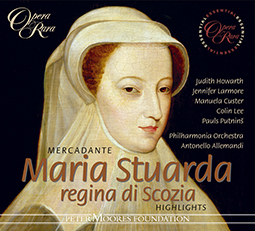 01 Maria Stuarda regina di Scozia: Act I scena I: Introduzione: Ormai trascorsa e l’ora – scena II: Or che risolvero? 02 Maria Stuarda regina di Scozia: Act I scena III: Duetto: Che bel piacer gradito – scena IV: Regina ? 07 Maria Stuarda regina di Scozia: Act II scena III: Duetto: Ahi! Scellerati! – scena IV: Regina sventurata! 08 Maria Stuarda regina di Scozia: Act II scena V: Aria: Ah! Che finor fu vano – scena VI: Or che adunati siam – scena VII: Qual dagli ?